Planning an international SEO strategy should be the first step any online business takes in its international growth plan. Implementing an agile global SEO plan makes the succeeding translation and localisation process more efficient and streamlined, and is likely to see sharper growth in international customers. Here, we break down the key factors you need to consider before diving into translating your website. Online business and e-commerce is being increasingly driven by local search. This has seen companies providing their target audiences with an ever more detailed and localised web experience. The most successful international retailers sell in the customer’s native tongue and cater to their expectations and tastes. They provide the goods and services that the market demands and cater to the local currency. Few brands succeed in the competitive retail space with a web presence that appears distinctly foreign and shows little knowledge of the local market or cultural nuances. Ensuring that your website is accurately and astutely translated and localised is therefore one of the most important steps towards establishing an international client base. But while your website may be the shop window for your business, you need to ensure that the shopper can, first, find your shop and, second, be sure that the products are indeed readily available to them. International SEO goes beyond translating your website copy, adapting culturally suited images and re-wording your calls-to-action (CTAs). In fact, the process begins before the first word on your website has even been translated. We’ve rounded up the most important factors to consider on your international SEO journey, from gathering and harnessing an understanding of your target market, to deciding on how you want to structure your website domain. Ask yourself: is there sufficient consumer demand in your selected target markets to justify a localised presence? How you choose to quantify this justification is up to you. You may wish to rely on data and market forecasts. Or you may want to base it on online user behaviour. Google’s Keyword Tool in Adwords will give you an idea of the local search volume for your product or service. Search engines popular in other countries, such as Yandex in Russia and Baidu in China, offer similar keyword research services. Also look closer to home and analyse how overseas audiences are engaging with your domestic website. For example, is it attracting traffic – and potentially conversions – from aboard? Google Analytics gives you a comprehensive breakdown of user behaviour and page visits based on location. High international visitor numbers suggest that an international audience is already interested in your brand and what you offer. Now it’s time to begin planning your website. 2. Language or country targeting? If prospective international demand compensates localising your website and building up a web presence in new markets, consider whether that demand is specifically country-based or more broadly language-based. Are Spanish-speaking users landing on your website from one country in particular, or from all across South America? This seemingly trivial distinction will actually have major implications for your international SEO strategy as you move towards the later stages of the translation and localisation process. Country targeting works best when there is enough traffic and potential demand from a specific country to justify targeting that particular segment of your audience. Indeed, this is generally considered best-practise: a more local and personalised user experience will drive a higher conversion rate and rank better on search engine results pages (SERPS). More on that below. If part of your international growth includes establishing a physical presence, then a country-targeted website for that market is the obvious way to go. Search engines generally place a lot of value on websites that have a local address attached to them. However, these added benefits don’t come for nothing; country targeting is altogether a more comprehensive and complex localisation process, as it leverages cultural nuances and utilises domestic dialects. If your current website is not yet attracting enough traffic from a specific country, starting with language-specific targeting is an ideal first step in the right direction towards establishing a more global audience. While not quite providing a fully personalised user experience, language targeting and translated website content does allow you to engage and connect with international users from a wider range of countries, albeit more generically. For example, your Spanish website will cater to users in Spain, as well as across South America, albeit not in the hyper localised manner that it potentially could if it was country targeted. We would suggest that language targeting is a smart first step for companies looking to test the waters in international markets. However, the longer-term strategy should be to build country-specific websites out of these translated websites and to ultimately offer the customers as native a brand experience as possible. Google dominates the European search market, and boasts almost 70 per cent of search engine market share in the United States. Not everyone uses it, however. The internet giant fares less well in countries with strong local search engine providers. 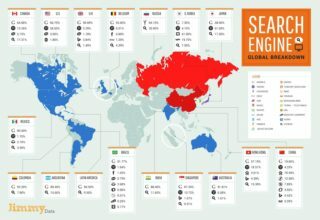 Yandex dominates the Russian search market, while Baidu dominates Chinese search traffic. Naver, the South Korean tech giant dominates in its domestic market while, interestingly, Yahoo! remains the go-to search engine in Japan. Image courtesy of Jimmy Data. Fortunately, all these search providers offer keyword planning tools similar to Google’s. This will provide crucial insights into how your product or service is understood and searched for. Evaluate whether users are searching mainly based on keywords or searching based on queries. Also pay attention to how results are displayed on different search engines, and which SEO factors carry the most weight. Localise and translate your content in accordance with these findings. Also analyse the keywords that your industry competitors in the new market are targeting and which terms they are ranking for. Free tools like Alexa and SimilarWeb can give you a good macro idea of what’s going, though you may need to look into procuring more sophisticated, premium tools for a more detailed competition report based on location. There are three basic types of international domain structures: ccTLDs (Country Code Top Level Domains), subdirectories and subdomains. Broadly speaking, geo-targeted ccTLDs carry the most SEO weight locally, as does setting up a local hosting platform. However, this solution may not suit everybody. With ccTLDs, the domain name is followed by the specific country code, such as www.mybusiness.fr or www.mybusiness.jp. These boast the loudest signal for geo-targeting, as well as the highest level of localisation. International SERPs will often favour sites with the relevant country-specific TLDs. 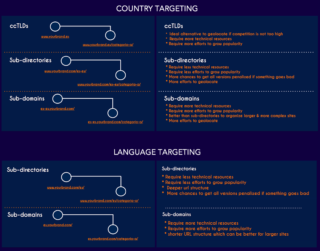 While this is certainly the best-practice approach when country-targeting, it is also the more costly approach, with new domains having to be purchased for each target country. Indeed, some ccTLDs can be tear-jerkingly expensive. A further cost is incurred by setting up new hosting for your site. Ideally, files for this domain should reside on a server located in the target market and hosted with a local IP address. Search engines generally favour locally hosted websites and reward their faster loading speeds. Important: Always be sure to conduct stringent due diligence and vetting procedures when selecting a foreign hosting provider. Also bear in mind that this will be a fresh domain, and will not carry over any of the authority that you’ll have built up with your root website. This is a hyper-local, but also ground-up approach. These are the most practical domain structures when targeting by language, and can work quite work well even when country-targeting. A typical subdirectory domain would be www.mybusiness.com/fr or www.mybusiness.com/jp. The set up is relatively straight forward, as the foreign site sits as part of the root domain, thereby also inheriting its domain authority. This approach, however, lacks two key advantages offered by ccTLDs. First, subdirectories generally do not tend to rank as highly as ccTLDs in local search results. Second, since they are hosted from your domestic server, they might also incur slower times for international users, once again influencing website rank in the SERPs. Subdomains can be useful in that they can target both countries and languages. However, that’s pretty much the only advantage they offer. While they exist as separate domains that can therefore be hosted in the target market, they do not have specified ccTLDs at the end of the domain and are therefore not directly recognised as local domains by the search engine. For example, www.jp.mybusiness.com is not immediately recognised as a Japanese targeted domain, but rather as a generic .com domain. Also, as with ccTLDs, they do not carry over domain authority from the root domain. In sum, therefore, they subdomains pose more of a burden than a convenience, which is why we suggest best avoiding them. Once these fundamental considerations have been addressed and implemented, you’re now ready to translate and localise your website content for the target market. There still remain more technical considerations to bear mind during the process, such as site structure and the hreflang annotation. And then there’s also the lengthy process of marketing your brand and website to your new audience, in their language, and in a way that stirs their emotions. It’s a challenging but always an exciting journey. Plan well, act smart and you will go far.